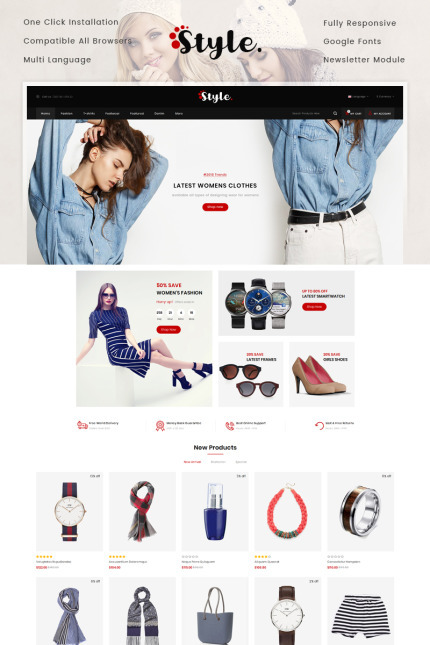 Style Fashion Store Opencart responsive template is perfectly design for Fashion, Apparel, Shoes, Accessories, Men, Women, Jewelry, Watch, minimal and multi purpose stores. This theme is unique and look simple for selling fashion and accessories items. This template also support multiple language and currency. It's 100% responsive that means this theme display properly like application in mobile browser. We provide quick start files for this theme to install this theme on your server with just one click with all demo content.